Unfinished shelf bracket made of hardwood. Bracket measures 3″ X 5″. Bracket can be used to support a small shelf. Hardware is included. Sold individually. Unfinished shelf bracket made of red oak. Bracket measures 4-1/2″ X 6″. Bracket can be used to support a small shelf. Hardware is included. Sold individually. Unfinished shelf bracket in spruce fir with occasional pin knots visible. Bracket measures 5″ X 7″. 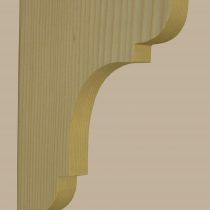 Bracket can be used to support a small shelf or mantle. Hardware is included. Sold individually. 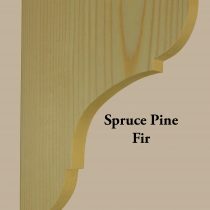 Unfinished shelf bracket available in premium pine, rustic pine, or poplar. Bracket measures 8″ X 10″. Bracket can be used to support a small shelf or mantle. Hardware is included. Sold individually. 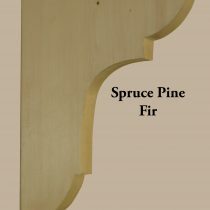 Unfinished shelf bracket available in premium pine or rustic pine. Bracket measures 9″ X 12″. 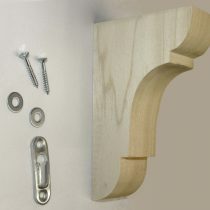 Bracket can be used to support a small shelf or mantle. Hardware is included. Sold individually. 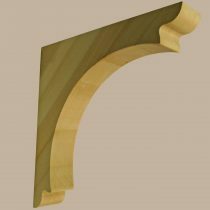 Unfinished hardwood arch bracket available in three sizes; 10″ X 10″, 7″ X 7″, and 5″ X 5″. Brackets can be stained or painted. Brackets are sold individually with hardware. 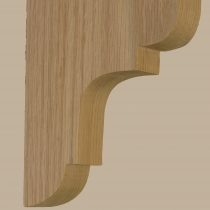 Unfinished solid hardwood arts and craft corbel bracket. Available in two sizes: 9-1/2″ X 5-3/4″ X 4-3/4″ and 6-5/8″ X 3-7/8″ X 3-1/2″. 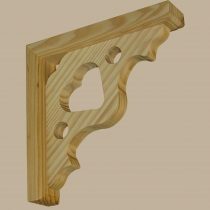 Ideal as a decoration or for supporting shelving or mantle. Ready to be painted or stained. Hardware included. 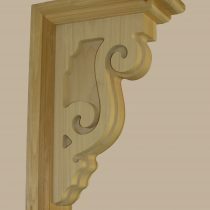 Unfinished solid hardwood grand corbel bracket in a classic style. Measures 16-3/4″ X 5″ X 10-1/2″. 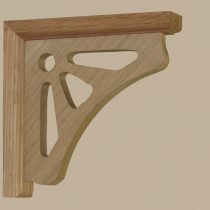 Ideal as a decoration or for supporting shelving or mantle. Ready to be painted or stained. Hardware included. Unfinished red oak sunburt bracket measuring 7″ X 7″. Decorative support for shelving. Ready to be stained or painted. Sold individually with mounting hardware. 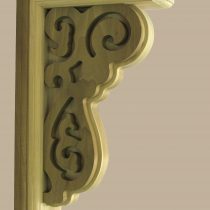 Unfinished solid hardwood grand corbel bracket in a floral design. Measures 16-3/4″ X 5″ X 10-1/2″. 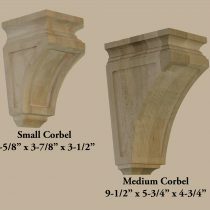 Ideal as a decoration or for supporting shelving or mantle. Ready to be painted or stained. Hardware included. Unfinished pine heart bracket measuring 7″ X 7″. Decorative support for shelving. Ready to be stained or painted. Sold individually with mounting hardware. 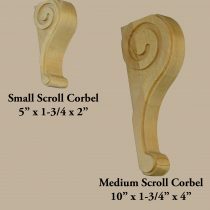 Unfinished hardwood scroll bracket available in two sizes; 4″ X 10″, and 2″ X 5″. Brackets can be stained or painted. Ideal for light support or decoration. Brackets are sold individually with hardware.